A simple chronological recitation of our past few days in Guadalajara (more photos) would not do justice to how much we have enjoyed visiting this city. 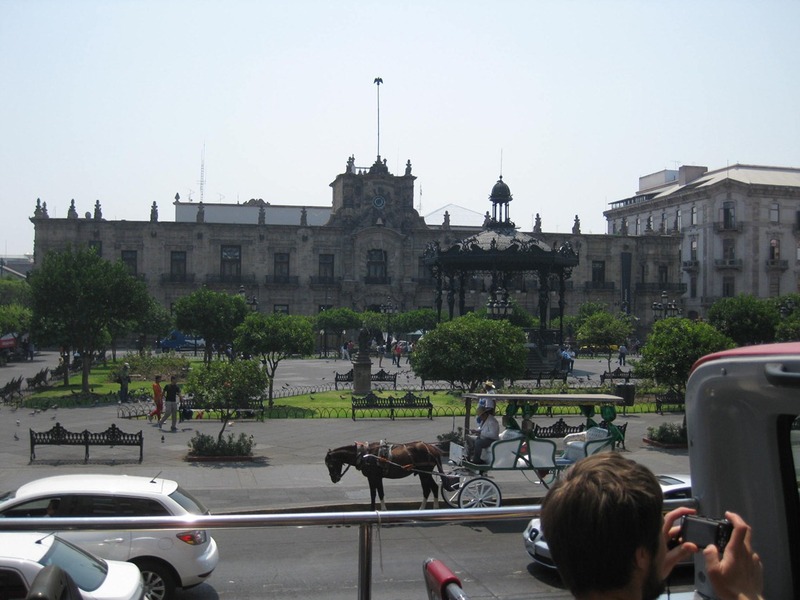 As Mexico’s second largest city with 6 million inhabitants the city is much too large for us to have seen it all or even a substantial portion. Nevertheless, we have tried to experience a representative sample of some of the unique aspects of life here. Here are some of our favorites. 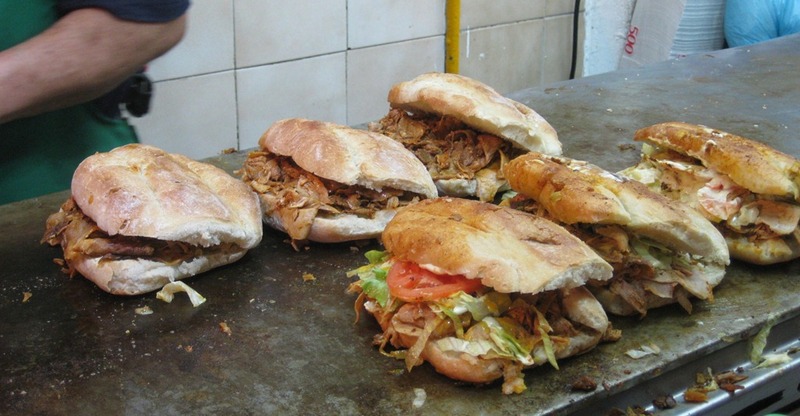 One of the unique food treats here in this part of Mexico is the torta ahogado. It starts with a crusty roll shaped more like a half circle rather than the more familiar torpedo shape. They then pile on slices of roasted pork, shredded cabbage, tomato slices and some of the juice from the pork. Then the sandwich sits on a hot grill to add a little extra crisp to the bread. Just before serving they dribble some “special sauce” that is mayonnaise based. Once the sandwich is on your plate you can spoon on the chili sauce to suit your taste. Ahogado means drowned in Spanish, the chili sauce being the drowning agent. Do I need to tell you that it’s really good? Tonala is a small town which has become a suburb of Guadalajara. It sits about 13km southeast of Central Guadalajara. Here you can find a huge selection of items produced by local artisans: furniture, leather goods, pottery, ceramics, hand blown glass, jewelry, toys, candles and much more. 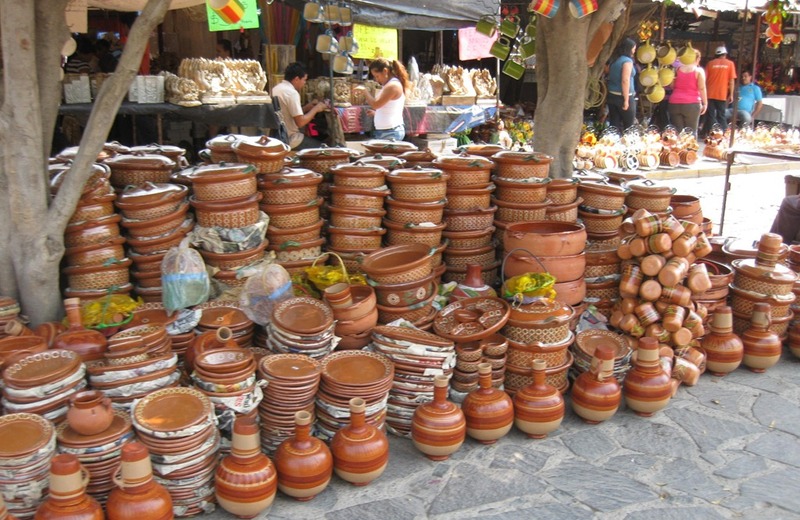 The streets are lined with these shops and workshops plus there is an open air market with row after row of tents plus some sections where they are forming and finishing clay pots. On Thursdays and Sundays, this all spills out into the streets and takes on the air of a festival. I got confused and planned our trip for Saturday thinking it was Sunday, however we were overwhelmed with what we saw. Ground zero of the historical central section of Guadalajara is Plaza Guadalajara and Guadalajara’s Cathedral. The cathedral was completed in 1618 and with its stained glass renderings of the Last Supper and Tuscany style gold leaf pillars, it is magnificent. Plaza de Armas and the neoclassical Palacio de Gobierno, which houses state government offices sit to the south of the cathedral. To the east is the Plaza de la Liberacion which leads to Teatro Degollado then to Plaza Tapatia and the cavernous Mercado San Juan del Dios, a three story market covering two city blocks. We wandered this market on more than one occasion trying to decide among the seemingly endless variety of foods being offered by the food stalls and small restaurants that can be found there. Among the outings we embarked upon within the city for the dual purpose of exercise and sightseeing, was a walk to Parque Agua Azul (Blue Water Park) which has lots of trees, expanses of green lawn and benches along with cages of exotic birds and a butterfly exhibit. On another day we walked to Zona Rosa, an upscale neighborhood. 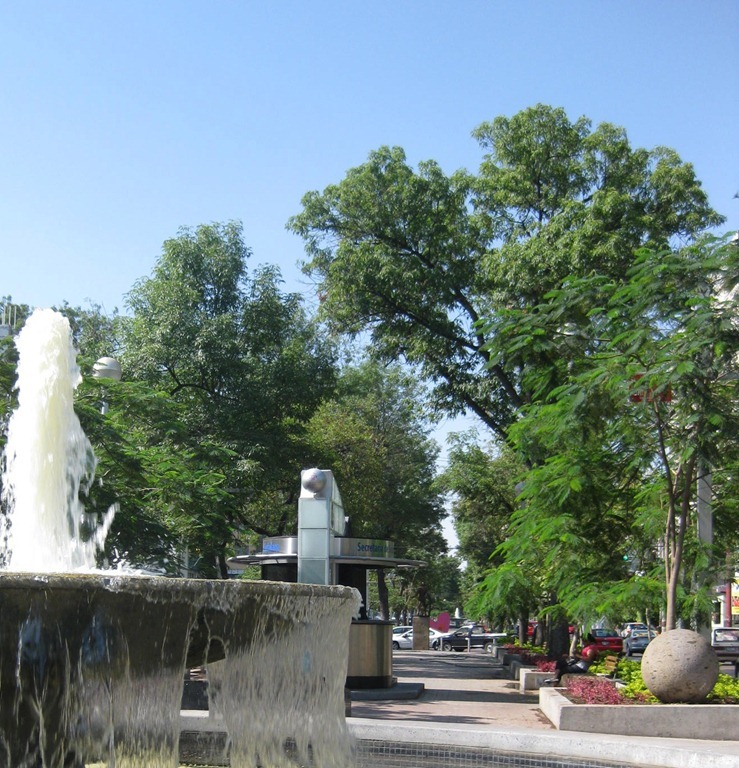 The primary thoroughfare through this area is Avenida Chepultepec in the center is which is a 9 block long walkway with trees and benches and a fountain on each block. Guadalajara really loves the fountains, we were told there are some 140 throughout the city. We continued our walk past Zona Rosa to Centro Magno, a very modern three level shopping mall. Legend has it that when lighting struck an agave plant, the indigenous people made a discovery that led to the process for the distillation of tequila. 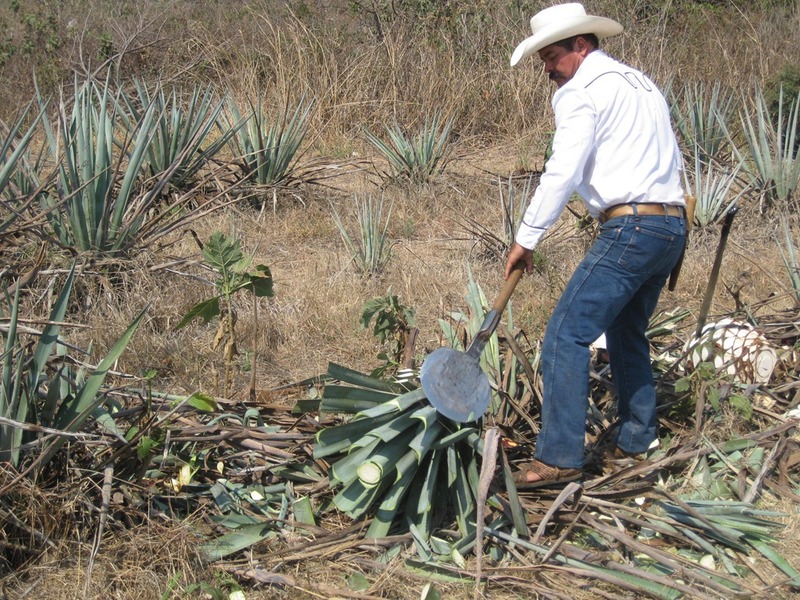 The state of Jalisco, which contains Guadalajara, and more specifically the village of Tequila is the home of this industry where the overwhelming majority of all tequila is produced. There is a minor amount produced in a couple of the neighboring states. We went on a tour to the village of Tequila where there are 24 tequila distilleries, visited an agave plantation for a demonstration of some of the processes for growing and harvesting the agave plant and toured one of the plants belonging to Mundo Cuervo, the maker of the Jose Cervo family of tequilas. Yes, we got samples. Today we left Guadalajara and took a short bus ride south to Lake Chapala where we will be for the next few days.